Make your backyard habitat a healthier place for wildlife. Use safe alternatives to chemical pesticides. • Pull unwelcome weeds like dandelions and thistles instead of blasting them - and other wildlife - with chemical herbicide. 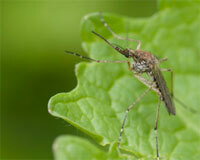 You'll find excellent books about natural pest control alternatives at most libraries. • Pluck infested leaves by hand to help control pests like birch leaf miners and leaf rollers. • In late fall or early spring, prune branches containing the greyish egg bands of tent caterpillars. Scrape egg bands off limbs too large to prune. If they've already hatched, pick off the larvae when they gather in their nests at night or on cool days. • Blast insects out of trees and shrubs using a garden hose. This method works especially well on aphids, spider mites, and pear and cherry slugworms. • Plant marigolds, garlic, chrysanthemums, chives, onions, basil, savoury, or mint amongst your backyard plants. Their natural odours and root secretions smell revolting to some insects. • Attract hungry insectivores, such as bats, warblers, and predatory insects, using one of our projects, such as "Build a Bat House". • Brew your own insect control by mixing 100 ml of crushed hot peppers with 400 ml of water. Strain the concoction and spray it on affected plants. Be careful: Peppers can burn skin and eyes. • Remember: Nature often provides its own pest control in the form of birds and insects that devour the species we consider nuisances. • Know a friend from a foe. For instance, the ladybird beetle larva looks threatening but is an important ally with a voracious appetite for aphids. Find out how both you AND Canada’s animals and plants benefit from wildlife-friendly gardening. Some perks include saving money, time, healthier food, cleaner swimming and drinking water, and more!